At DiMeo's Blueberry Farm Weddings you can be original. Couples love to host their outdoor farm wedding at our NJ farm. Our New Jersey blueberry farm is a truly original idea for a gorgeous country farm wedding. We are the most beautiful farm wedding location in South Jersey say happy couples who chose. Each of our farm weddings promote NJ blueberries, buying local and growing your own blueberries. Call (609) 561-5905 to get fast pricing. Then schedule a self walk-through tour and bring all your decision makers to a formal sit down meeting with the farmer. We are an outdoor-only NJ farm wedding location that can host your special day under a gorgeous white sailcloth wedding tent. Check-out our beautiful farm wedding photo gallery on Pinterest. Our picturesque pick your own blueberry farm has perfectly manicured green lawns for outdoor sail cloth wedding tents, landscaped rear patio with fire pits, picnic areas, lit forest perimeter for amazing ambiance at night and plenty of on-site farm parking for guests. Make an appointment to tour our farm wedding venue location in New Jersey that will create an unforgettable country wedding for all. For our blueberry plant customers, this is also a "training farm" where we can coach you for free on how to start your own pick your own blueberry farm. All you have to do is buy blueberry bushes from DiMeo's Blueberry Farm and there is no charge. CALL NOW to schedule a self walk through tour with all the "decision makers" involved in planning your wedding: (609) 561-5905 for outdoor rustic farm wedding ideas and wedding location details you will love. Most couples say that "winery & vineyard weddings are so over-played" these days, but DiMeo Farms is clearly a much more original wedding concept. 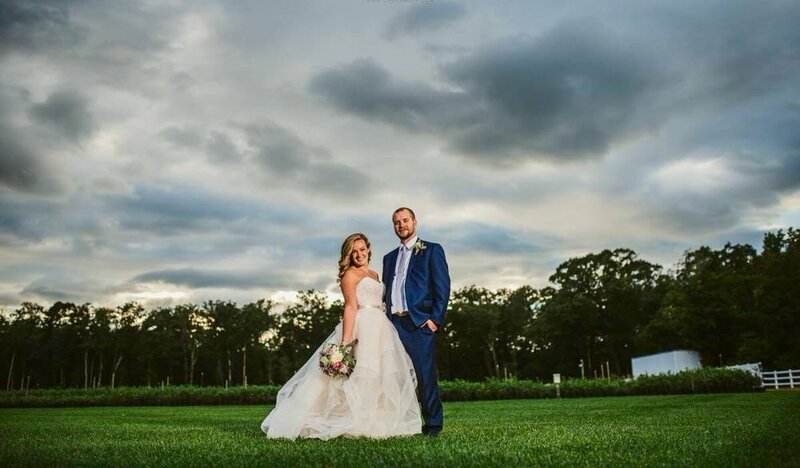 Your farm wedding guests will have a full-panoramic view of our beautiful blueberry fields with gorgeous New Jersey Pinelands forest as the backdrop. 80' foot tall red cedar trees are illuminated at night for unique seating areas along the forest with cedar tables and chairs surrounding fire pits. WATCH BELOW VIDEO to see us in action at a recent small farm wedding that we hosted for one of our customers. You can get married in the forest like this couple did, and then have your reception in a gorgeous sail cloth wedding tent outdoors. Unfortunately, we do not offer an indoor option at this point, at the white barn building merely serves as a backdrop for the wedding and cannot be used for any events. All weddings or other events at DiMeo Farms are outdoor-only under a gorgeous sail cloth tent. Below is a wedding photo of just one of several DiMeo Farm outdoor event spaces available in New Jersey. A perfect event area for rustic farm wedding tents or you can use the grassy areas for the actual country wedding ceremony and wait until you see how beautiful the wedding photos come out. We can also host children's events that educate on how we grow New Jersey blueberries and NJ blueberry plants and also outdoor events that will involve the education on how to grow blueberries and blueberry plants. Our goal is to provide the perfect outdoor farm event space and to encourage agricultural-related educational activities in NJ. Such activities promote, preserve and grow the "local American farmer" and family blueberry farm in New Jersey. This is a very early set-up photo, taken just before our wedding planner decorated this beautiful, classic, sail cloth tent. Just to give you a rough idea. Our farm wedding planner used a "naked wedding cake" for her country wedding on our blueberry farm. The custom cake included our New Jersey locally grown blueberries as we promote locally grown New Jersey berries at all of our outdoor farm events. We feel that it makes the wedding more special when you also bring together" the agricultural output of our fruit farm, such as blueberries and blueberry bushes and integrate all of it into our weddings at the farm. When you take your self walk-through of our family blueberry farm and meet with our one of the farmers, you will be impressed with our original farm wedding design ideas, like this farm wedding cake our customer had designed through the baker she chose. With DiMeo Farms, YOU custom build the farm wedding package that you want, unlike other venue locations that require you to go with their required catering company, we don't do that here. Keep scrolling down, you will see the windows behind the live musicians are the windows that provide a full-panoramic view of our gorgeous family blueberry farm with old farm photos of the DiMeo family blueberry farming legacy that starts with the very first generation of DiMeo's great-grandop DiMeo, leading up to the now fourth generation of DiMeo blueberry farmers. Check out more photos on our DiMeo Farms Facebook profile which features even more farm wedding photos. Since it's a family blueberry farm wedding, most of our customers like big sail cloth wedding tents on the front or back lawn areas or they like to go with the rustic wedding option below that is just another option for you. If you want a unique memorable wedding location then DiMeo Farms is your best option, since many couples today agree that "winery vineyard weddings have been so over-played" and that "they simply don't stand-out anymore" like they used to. Be different from all the same old "cookie-cutter" wedding venues, and let us help you be original. We had well-known musicians play for guests live entertainment, a violinist, amazing harpist and even a hammered dulcimer player at our grand opening party for the owner and his private guests. We have trusted relationships with impressive, talented entertainers and can get you the best musician at low pricing. Not only a gorgeous NJ family blueberry farm, but a turn-key country wedding package for a memorable rustic farm wedding or other special event that you would like to have at our agritourism farm in New Jersey. CALL NOW: (609) 561-5905 to schedule a walk-through appointment with one of our DiMeo blueberry farmers to discuss all the wedding details. After you sit down with DiMeo Farms, we are confident that you will know we are the right farm wedding location in NJ for your special wedding day. We accept just small number of weddings per year, to keep our location unique. Our recommended NJ licensed catering companies are simply the best and most experienced. Amazing freshly prepared dishes at a price much lower than you might expect. Only because (much like with our blueberry plant customers) we have relationships with some of the best contacts in the NJ wedding industry. We do not provide, handle, prepare or serve any foods or drinks ourselves, but we require a NJ licensed restaurant or catering company and it's licensed chefs who will provide, prepare, handle and serve any beverages or foods. All event activities at our family farm are geared toward NJ agritourism to make the public aware of the importance of eating healthy NJ blueberries from our beautiful farm locations. At night, as shown above, we can literally light up the gorgeous forest surrounding our pick your own blueberry fields and the fire pit camp sites make a great place for smaller groups to take a walk around the farm, get a chance to talk privately and enjoy hanging out at one of these really cool spots along our PYO blueberry farm. CALL NOW: (609) 561-5905 for details. 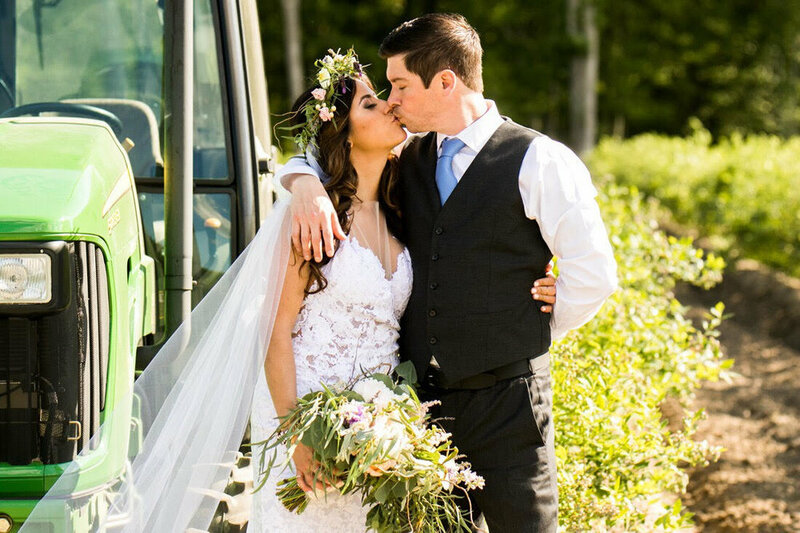 Your guests will love our original rustic blueberry farm wedding spot just like the happy below couple did when they chose DiMeo Farms. It becomes a magical place at night as everyone dances along the blueberry fields with the absolute feeling of connecting with the forest and nature. Many of the wedding guests become new customers, that's how much they love it at DiMeo Farms. We can show you more country wedding photos during your farm walk-through appointment with our wedding planner. At night, our farm wedding location is simply gorgeous and creates such a cozy atmosphere, as your guests are cradled between our blueberry fields with the Pinelands forest region lit up behind our farm properties. We fully restored Great-Grandpop DiMeo's 100 year-old wooden corn crib and converted it into a really cool serving bar for drinks and cocktails. At night, it looks especially cool all lit up with the servers in there. Here are just a few photos of the back of the white barn building and the old wooden vintage corn crib serving bar to give you an idea. Here is Great-Grandpop DiMeo's 100 year-old, vintage wooden corn crib with a really gorgeous chandelier hanging down the center. This can serve as one of the outdoor cocktail-hourdourves bars at the beginning of the wedding, but can easily convert to serve coffee, desserts and after-dinner drinks to your wedding guests that will be hanging around our beautiful fire pit. You can decorate it yourself and save lots of money, or you can just hire a local NJ farm wedding planner do it for you. The choice is yours. We are flexible and very easy to work with. CALL NOW: (609) 561-5905 to get pricing (and if everything meets your budget) than you can schedule a self walk-through tour and a formal sit-down meeting with Mr. DiMeo. We always encourage everyone to "bring all decision makers" with you to the meeting so we can discuss all questions. Look at the serving bars on either side. Keep in mind this was not even decorated yet. Once it had all the farm wedding decorations added, it was simply gorgeous and will create original photos which is important to make your farm wedding different from all the other weddings" such as with wedding photos taken at a typical winery venue. Everyone has been to the wineries for a wedding, and at this point, they are just so over-played. Be original, different and memorable with our DiMeo Blueberry Farm wedding location, which by the way, is a brand new location that you will absolutely love. 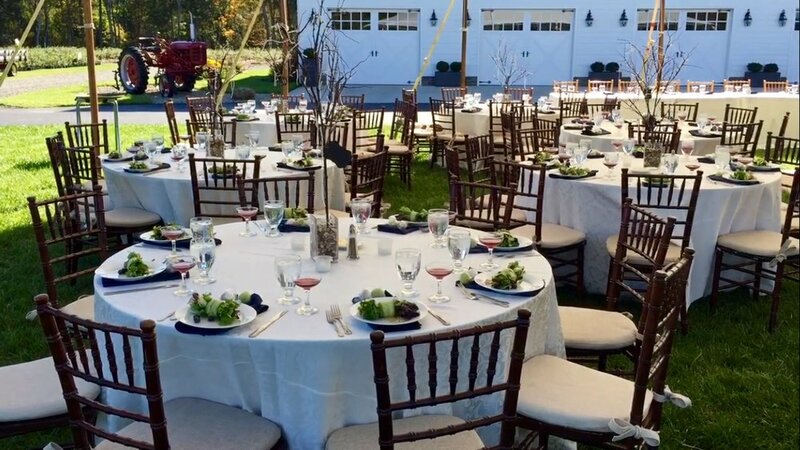 Here’s another photo of a different design we created, but this time using darker color chairs and our white barn building and blueberry fields served as the visual backdrop with NJ blueberries being used in all the dishes. As you can see in the salads on the table, blueberries are the feature along with blueberry wine. All of our events promote blueberries and buying local from DiMeo Farms in Hammonton. Our tent company sets up gorgeous white wedding ceremony chairs along the forest and between one of our many blueberry fields so that guests have a full panoramic view of not just the farm, but the beautiful Hammonton Creek and surrounding forest. It really is a magical experience that once the music is playing really captures people in a special way that will be remembered forever. This is what the set-up looks like.